My little brother was born in September of 1970, two months short of my 5th birthday. I suppose that taking care of an infant and an annoying pre-schooler (that would be me) was a bit much for my mom, even though her mother lived downstairs and was always more than happy to keep an eye on one or both of us. To get a little bit of a break from two kids hanging on her, Date Night was instituted. Not between Mom and Dad, but between me and Dad. Once every other week or so, Mom would dress me up and ship me out of the house as soon as Dad got home. He worked late in those days and was seldom around for dinner, so getting together, just the two of us, was kinda special. So what did we do on our nights out? See Disney movies and eat fast food? Of course not! We went out someplace nice to eat, like the grown-ups we were. Keep in mind that this was nearly 40 years ago now so I don't remember every excursion, but one in particular sticks out in my mind: a visit to Mee Jun Lo. Mee Jun Lo was a Chinese restaurant on Mulberry Street, near Baltimore's minuscule Chinatown. It was a bit of a hole in the wall, up a dark flight of stairs into a dark room full of interesting smells. We usually went to Jimmy Wu's, up on Charles Street, so Mee Jun Lo seemed...exotic somehow. I remember that one of us ordered shrimp with black bean sauce, something I had never before tried. The flavors of shrimp and garlic exploded on my palate, with the salty beans adding an earthy quality. I was plenty used to garlic as I had been exposed to fresh Polish kielbasa in the womb, and one of my maternal aunts had married an Italian man whose father taught her a vast repertoire of Sicilian dishes. But the combination of shrimp and garlic and those funny black things - that was new to me. I'm not sure I ever ordered shrimp in black bean sauce ever again. But the flavor of that first-ever dish still lingers in my mind. Rinse the shrimp and pat dry. 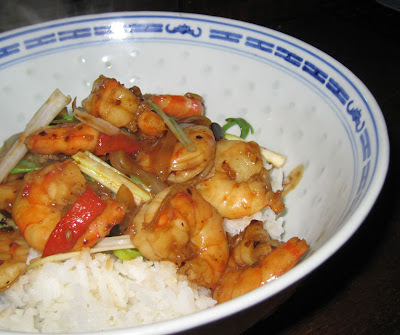 Place the shrimp in a bowl and stir in the marinade ingredients and marinade the shrimp for at least 15 minutes. Heat the wok and add oil. When the oil is hot, add the onion and cook until it begins to wilt. Then add the black bean sauce and fresh ginger, stirring it together for a few seconds until aromatic. Add the shrimp. Stir-fry briefly until shrimp turn pink and opaque. Stir in the green onion. Serve hot over rice.